Xenoblade Chronicles X is a massive game—and one I am still not even close to finishing. However, with over 70 hours of gameplay under my belt, I think I am finally ready to tell you what this game is all about. Sometime in the near future, two alien races battle near Earth. Recognizing that the planet is in danger, the human population loads into space colony ships to escape the looming destruction of the planet. Xenoblade X follows the American colony which, after being pursued by one of the alien races, is forced to crash land on the planet Mira and begin life again on a hostile—though beautiful—alien world. You play as one of the Earth survivors whose cryo-pods were scattered across the planet during the colony’s rocking landing. Together with the other soldiers like yourself, you work to explore the world, find other survivors, and help the citizens of New Los Angeles acclimate to their new home. The main story of Xenoblade X is not exactly meaty—it is only 12 missions long. However, that doesn’t mean the game isn’t packed with other content. There a numerous side quests to be done in between story missions—one or two of which are usually prerequisites for starting the next story mission. These quests take two forms. The first are quest board-style quests with no story component, just a blurb telling you where to go or what to do. The other set of side quests are called “bond” quests. These quests allow you to create an emotional bond with various citizens of New L.A. You get a few short cutscenes detailing their lives and problems in the crashed space colony. The way in which you complete the side quests is largely the same: You go out into the world, kill some monsters/find some items, and return back to base. Occasionally, the game tries to change it up by making you use a certain weapon or by sending you off to hunt a monster that only appears in certain weather conditions; but all that really serves to do is make the fetch quests more monotonous. This is one of those games where flat-out grinding is often a quicker way to level up than questing. Unfortunately, the battles tend to be as monotonous as the quests. As I talked about at length over on US Gamer’s RPG Podcast, Xenoblade X plays like an MMORPG despite its single player nature. You have your auto attack (which goes off at regular intervals) and then various special attacks, skills, heals, buffs and debuffs on a shortcut bar at the bottom of your screen. When you attack, you are able to switch between two weapons, one melee and one ranged. What kind of ranged and melee weapons you can use is dependent on which class you are playing as—with the possibilities ever increasing as weapons (and therefore attached skills) from previously mastered classes are also available for the choosing. Switching back and forth between the weapons—and using special attacks when possible—is the typical cycle of combat in Xenoblade X.
Healing is handled interestingly in Xenoblade X. While there are a few heal spells—and many buffs also include a bit of HP recovery—most of your healing will be done in a different way. In battle, your teammates will occasionally call out for you to perform a certain kind of attack or skill. If you do so, you and your teammates get a small bit of HP back. Because of this, you often don’t need a dedicated healer in the party—which in turn allows you to try out the game’s different classes without handicapping yourself. Strangely, there are no line-of-sight rules in Xenoblade X. As such, an enemy can attack you through walls (or even mountains) as if there is no obstruction at all. The lack of line-of-sight rules for the AI also makes typical MMORPG battle tactics like line-of-sight pulling and kiting impossible. Running away from a hopeless battle is likewise much more difficult. This also means that most battles simply involve running in a circle around the enemy while at your max melee range, trying to stay away from its attack angle as you maneuver to hit its weak point. More complex tactics are simply not practical. So despite the large amount of skills, weapons, and classes in Xenoblade X, I found the game’s combat to be a slog more often than not. Not only is the combat boring, but painfully slow as well—even by MMORPG standards. Normal battles against single monsters of the same level rarely take less than a minute—and often much longer. Things do speed up a bit in battle once you get a team of fully loaded-out mecha—which happens around the game’s midway point—but then you have to deal with fuel and cash flow issues. However, a mecha has one other fantastic quality: It makes exploring the planet much faster and easier. The alien world of Mira is by far the best aspect of Xenoblade X. Made up of five major zones across two continents, Mira is just begging for exploration. Instead of simple mountains and deserts like on Earth, Mira is filled with wondrous alien environments: Impossible rock formations span the skyline, ancient alien relics sit looming in the distance, and strange and unique wildlife fill every nook and cranny. Frankly, it’s pretty enough that I have spent an inordinate amount of time just taking pictures of the world or jogging from one end of the world to the other. The larger map is split into dozens of smaller zones. Each has some sort of special objective associated with it. Sometimes, there is a boss monster in the area you need to kill. Other times there is a location ripe for an internet hub point for you to find. Completing one of these world objectives unlocks fast travel to said location—which is definitely a needed touch in an open world this large. 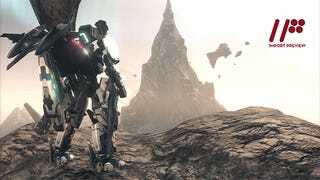 While outwardly simple, Xenoblade X is a game brimming with hidden complexity. Take the aforementioned internet hub points, for example. Instead of being nothing more than fast travel points, building the planet’s internet infrastructure (and accompanying mini-game) is actually your main source of income on Mira. The monsters don’t drop cash. Instead, they drop materials that can be used in the game’s vast crafting system to make everything from items and accessories to weapons and mecha parts. Another neat addition is that the armor you wear makes the maker’s company more popular—thus allowing them to put out more powerful—and badass-looking—armors for a more reasonable price. If I were to describe my 70 hours with Xenoblade X in one word, it would be “boredom.” The main story did little to get me invested, the side quests were repetitive at best, and the combat was a painfully monotonous slog even with the advanced classes unlocked. The game’s one redeeming feature is the world of Mira itself. In the years to come, I hope that the hours I spent exploring beautiful landscapes of this alien world are what I remember about Xenoblade X, and not, you know, everything else.